Are you searching for a romantic getaway or evening out in a unique setting? The Cumberland Valley offers plenty of opportunities to find a one-of-a-kind Valentine’s Day experience with your loved one. From fantastic dining opportunities to lodging choices that fit every style and budget, there’s no shortage of romantic options. Allenberry Resort is the ideal location for a luxury getaway. Situated on 57 wooded acres along the Yellow Breeches Creek, this full-service resort features more than 20 lodging options, including intimate rooms with premium amenities. Enjoy world-class entertainment at their onsite playhouse and then head to dinner at The Barn, Allenberry&apos;s flagship restaurant serving innovative farm-to-table meals. Don&apos;t forget to schedule an appointment for a spa experience at Changes Salon & Day Spa at Allenberry. where you can choose from a range of pampering services, including a couples massage. Before you check out, end your romantic weekend with a flavorful breakfast and local coffee at The Breeches Cafe & Bakery. 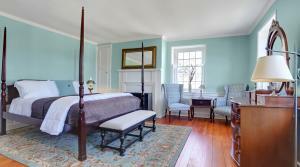 We also have a number of cozy B&B&apos;s with options for both town and country stays. Our warm and welcoming innkeepers will pamper you with personal touches and send you off with a delicious breakfast. If you don&apos;t have an entire weekend, there are still plenty of other unique ways to have an enchanting evening. Take a cooking class for couples at The Kitchen Shoppe or the Culinary Kitchen and Cooking School at Cornerstone Coffeehouse. Indulge with an elegant and romantic dinner at the Wine Spectator Award-winning Tavern on the Hill in Enola, the historic Boiling Springs Tavern, or Visaggio&apos;s Ristorante, also in Enola. For a more casual dining experience, try Cork & Fork Osteria in Camp Hill, RockBass Grille in Wormleysburg, or Chalit&apos;s in Mechanicsburg. 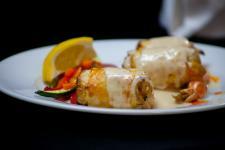 Click here to see a full list of all Cumberland Valley restaurants to find the right option for you. Make a few stops along our Cumberland Valley Beer Trail to experience distinctive flavors, specialty tastings, live music, entertainment, and unique pairings. Be sure to pick up a passport and get a stamp at each location in order to win some fun prizes. And, if you’re still searching for that last minute gift, don’t worry. Pick out a unique handmade piece of jewelry or another hand-crafted item at one of the Valley’s boutiques, sweeten the deal with a bottle of wine from Castlerigg Wine Shop, and top it off with indulgent artisan chocolates from Cocoa Creek Chocolate, available only from Brittle Bark in Mechanicsburg. Click here for more Valentine&apos;s Day suggestions -- from weekend itineraries to ideas for a romantic evening at home.